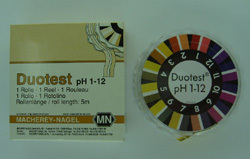 Macherey Nagel Duotest pH papers are a range of double indicator zone papers. Because there are two separate colours to compare to the colour code chart for each test, estimation of the pH is made easier. 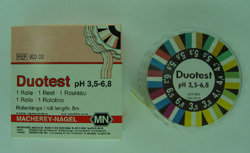 Duotest comes in 5 m rolls in a holder and refills are available. For the pH 3.5 to 6.8 paper the gradation is 3.5, 3.8, 4.1, 4.4, 4.7, 5.0, 5.3, 5.6, 5.9, 6.2, 6.5, 6.8. This is a good one for the beer brewers out there. Make sure you have the pH right in the mash in your microbrewery. The critical range is around 5.3 to 5.6 so the Duotest papers are just right.